Yihyeh b’seder. This is a common refrain in Israel. 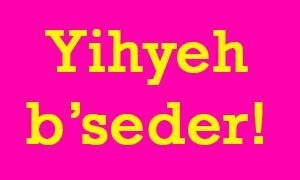 It means “It’ll be ok!” No matter what happens, no matter how bad or how scary things get, even the surliest Israeli has hope. No wonder the national anthem, Hatikvah, means “The Hope.” So I thought I’d borrow the phrase from Israelis, the one that’s enshrined in a beloved blog post by Benji Lovitt and the Nu Campaign t-shirt collection it inspired, and use it to name this public, open to everyone event. So what’s the deal? It’s simple. Taglit Birthright Israel is relaunching its Israel Alumni Association and this is their first step in that direction. This event, which is free to all Birthright Israel Alumni who pre-register and 10 nis for everyone else, will include lots of free wine, yummy snacks and hors d’oeuvres and entertaining talks by 5 Times of Israel writers. It was really hard finding them because, you know, Times of Israel bloggers are a rare breed. Rare indeed. But we got lucky and managed to snag some folks that are really entertaining. Thanks to Sarah Tuttle-Singer, I can’t say the word Rabbi or Rabbit without laughing. Benji Lovitt is a talented and beloved comedian and blogger, and he inspired the name of this event. There’s also my dear friends Laura Ben David, Devora Mason (aka ask Devora) and Zahava Englard, all talented, bright and super entertaining. It’s going to be a raucous, fun and wine fueled evening. For sure. Never mind that I misspelled raucous on ALL the promo material. Ha ha. Oy. Some writer. Another great thing about this event is that it is taking place downtown at the HiP JLM House. It’s a great venue that hosts a regular slew of speakers, social events and this women’s spa night that makes me crazy jealous. Because I can’t go. But I digress. Visit their site for directions on how to get to the event or simply call 058-5555699. 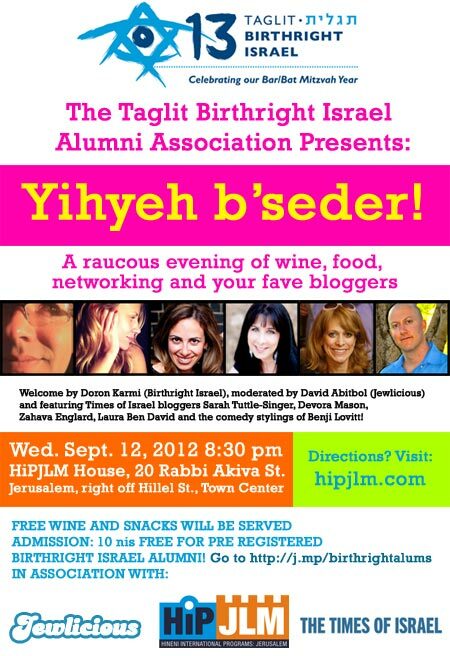 We would really like to have a great turnout for this event and if you are a Birthright Israel alum, please register. It may take a couple of minutes but you’ll only have to do it once and then you’ll get advance notice of future events. And you’ll get in for free! Not that 10 nis is so much money, but hey, free is free. You can also check out the facebook invite page, and share it with your friends. Come early as admission is limited! You should definitely send this info to the Birthright Israel Alumni in Israel listserv. Email to TaglitBRI@googlegroups.com. Or let me know if you want me to post for you.